The derelict Strathmartine Hospital had already been damaged by various incidents of fire-raising. Joint police and fire talks will continue to be given to school pupils in areas surrounding the former Strathmartine Hospital. The visits are targeting high schools and selected primary schools within the ward to highlight the risks and consequences of deliberate fire setting. Evidence indicates that youths are the biggest perpetrators of these deliberate fires and mobile CCTV and Dundee community wardens are also targeting the area. The former hospital was decommissioned in stages from the mid-1980s and the site has taken a pounding by vandals and firebugs since it finally closed in 2003. Group manager Roy Dunsire will deliver a performance report for the period from April to June to Angus Council’s scrutiny and audit committee in Forfar. He said: “There were 32 deliberate secondary fires reported during quarter two, which is above the three-year quarterly average. “It is pleasing to note the minimal impact of deliberate secondary fires on the former Strathmartine Hospital site, with one such fire occurring during quarter two. Mr Dunsire said they used the run up-to the summer holidays to engage with schools in Angus and “raise their awareness of the consequences of deliberate fire setting”. 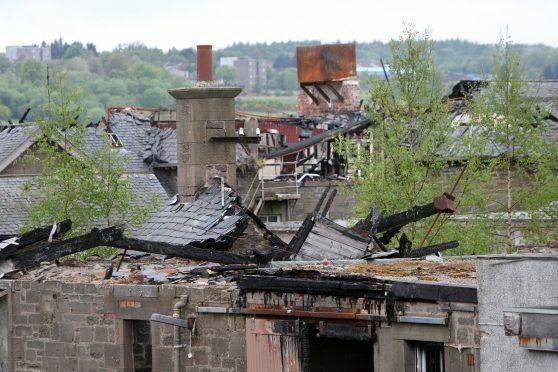 He said: “Joint police and fire talks are being planned in schools to further drive home fire related anti-social behaviour messages to school pupils in areas surrounding the Strathmartine Hospital site. “Deliberately set fires are dangerous; they waste time and money, and divert fire crews and other emergency responders away from real emergencies. “The cost to the SFRS and our communities is significant, with an estimated average cost of £2,000 for attendance at such incidents. In Angus, the SFRS attended 145 deliberate fires during 2017-18, and whilst the long-term trend is declining, Monifieth and Sidlaw experiences the second highest rate of deliberate fires when compared to the other Angus wards. Several fire damaged buildings at the site had previously been demolished on safety grounds and the ground floor openings to the listed building had been built up with concrete blockwork. Angus Council had resolved to approve an application for the redevelopment of the site in 2015, but the application was called in by Scottish Government ministers, who subsequently issued planning permission in April this year. Councillors were told that officers continue to regularly visit the site to ensure the buildings remain boarded up, and that the case remains open.